Could your phone be used for more than games? Nowadays, it seems as if everyone has a cell phone – from kids to our grandparents, they are commonplace. So why not design an application for the phone that could help improve our health? There are fitness tracking apps and calorie counting apps that are designed to help develop healthy lifestyles, but some suggest using text messages as forms of encouragement.1 One research study tested out the power of a text message in helping people become healthier over a period of six months. The primary outcome of the study was to determine the text messaging effect on cholesterol levels. After six months, the participants who partook in the text messaging intervention had an average LDL cholesterol level of 79 mg/dL which was lower than the typical intervention group who had an average of 84 mg/dL.3 The study also monitored blood pressure, body mass index (BMI), active smokers, and physical activity levels.4 These were all positively affected by the intervention – average blood pressure for the text message intervention group was 128/81 vs 136/84 for control, BMI was lower at 29 vs 30.3, and more physical activity was completed at 936.1 minutes per week compared to 642.7 minutes per week. The study also started off with 184 smokers in the text message intervention group and ended with only 88 people still smoking. Since cardiovascular disease can be managed by lifestyle changes (diet, smoking, physical activity), it is significant that the text messages focused on those areas and help explain why these results were observed.2 One limitation to the study is the small scale, which may not allow representation of the full effect of clinical outcomes. This study was conducted through a hospital facility so it is not known how generalizable this will be to the overall population. Additionally, the messages were only sent in English excluding non-English speakers, the final results were recorded through self-reporting, cost-effectiveness of the intervention was not studied, and the study was not completely blinded. Data from the research study above shows that text messaging could help to improve your health, and almost everyone has a phone so your motivation comes straight to your fingertips. If your doctor recommends you to be a part of a program like this then I suggest you strongly consider becoming a participant. If you don’t think a typical intervention approach is going to benefit your health, using this text message system could help to improve your health on your own time. It is great that they send little reminders to help motivate and remind you why it is important to follow through. Participating in something similar to this would be beneficial to improve your health as a whole. With today’s technology, this will likely become a bigger thing in the near future. Would you be willing to try using text messages as encouragement or as reminders? I know I would, everyone needs a little bit of motivation to get the ball rolling with whatever you are battling. Macfarlane S. Can A Simple Text Lower Your Cholesterol?. Diabetes Insider. 2015. Available at: http://diabetesinsider.com/can-a-simple-text-lower-your-cholesterol/39648. Accessed September 29, 2015. Heart.org. What is Cardiovascular Disease? 2015. Available at: http://www.heart.org/HEARTORG/Caregiver/Resources/WhatisCardiovascularDisease/What-is-Cardiovascular-Disease_UCM_301852_Article.jsp. Accessed October 1, 2015. Chow CK, Redfern J, Hillis GS, et al. Effect of lifestyle-focused text messaging on risk factor modification in patients with coronary heart disease: A randomized clinical trial. JAMA. 2015;314(12):1255-1263. University Herald. Texting Patients Could Lower Cholesterol, Blood Pressure. 2015. 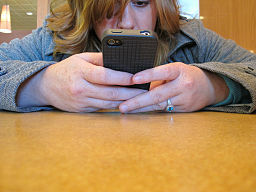 Available at: http://www.universityherald.com/articles/23954/20150923/texting-patients-could-lower-cholesterol-blood-pressure.htm. Accessed September 30, 2015. Comstock J. RCT: Text message-based program boosts adherence to appointments, medication | MobiHealthNews. Mobihealthnewscom. 2014. Available at: http://mobihealthnews.com/34749/rct-text-message-based-program-boosts-adherence-to-appointments-medication/. Accessed September 29, 2015. 6. Kamal A, Shaikh Q, Pasha O et al. Improving medication adherence in stroke patients through Short Text Messages (SMS4Stroke)-study protocol for a randomized, controlled trial. BMC Neurology. 2015;15(1). doi:10.1186/s12883-015-0413-2.